Cymbidiums are amongst the hardiest of orchids with the species originating from the Himalayas through South East Asia to Australia. Our modern cymbidiums are hybrids which can be expected to bloom year in year out under average backyard conditions given basic care. Light: While cymbidiums will tolerate full sun for all but the hottest of summer days in temperate Australia, filtered light gives the best results. Shadecloth (50%), pergolas, under lightly foliaged trees (e.g. eucalypts or silver birch) are good choices. Too much shade will inhibit flowering. Plants can be kept inside while flowering, but should generally be grown outdoors. 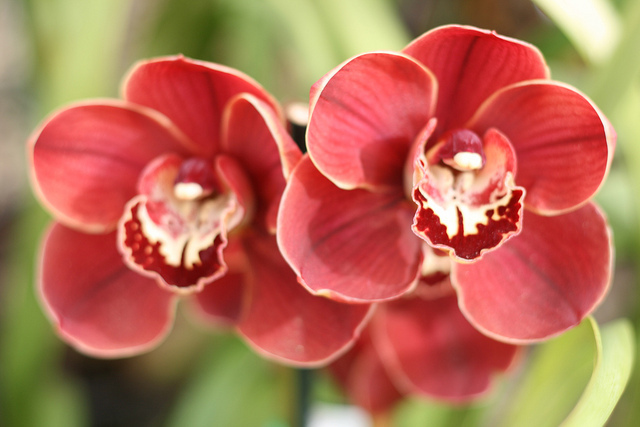 Water: While cymbidiums will tolerate extended periods of drought, drying out will inhibit growth. Conversely too much water will result in ‘wet feet’ and subsequent loss of roots. We recommend watering daily in hot periods, and weekly in cold, wet times, aiming for the potting mix to be evenly and consistently moist. Fertiliser: Virtually any fertiliser can be used at the lower end of the manufacturer’s recommendation. Both chemical and organic fertilisers have proven to be acceptable. Small, frequent applications of fertiliser give the best results. This can be simply achieved by using slow release fertiliser (say '6-9 month fertiliser') twice yearly. A 175mm pot would require about 3 heaped teaspoons. Potting mix: Soil should not be used. The components of the potting mix should be long lasting with good moisture holding capacity and provide excellent drainage. We use the following ingredients by volume: 45% composted bark, 45% coir, and 10% marble chips. Orchid potting mix available from garden centres is also acceptable. You should re-pot your Easy Orchid after about three years, or whenever the plant is outgrowing its pot or the potting mix is breaking down. Pests and diseases: While cymbidiums are not particularly prone to pests and diseases, caterpillars, slugs and snails may attack the flowers while scale and red spider can reduce vigour. Root and bulb rots can cause the death of a plant and are usually the result of over watering or a potting mix which has broken down. Normal gardening techniques including the use of insecticides will control any problems.